It seems trekking with BTC always has something new in store, despite having visited that place before. Be it Horaginabetta or Madhugiri or Antaragange etc, there's something fresh and enjoyable experience. And as ever, the group was wonderful, sharing lunch, snide jokes, cheeky pics, memorable games and so on. After getting down at Chikkaballapur, we hired two autos to reach Hariharpur village. Due to some confusion, we ended up going past the village and stopped near the quarry. The locals were very helpful and soon we were climbing towards Kaurava Kunda. Turned out that my concerns were all for naught :D Organizer Dinesh and over enthusiastic Sandeep happily found way ahead from whichever path we took. 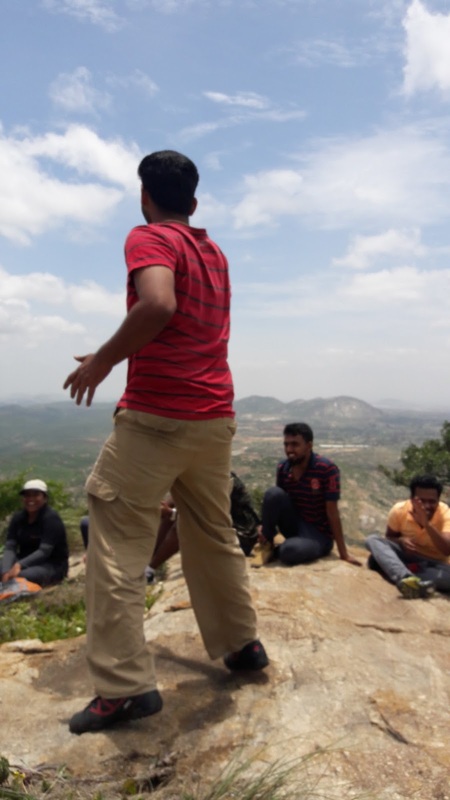 Apoorva, first trek as organizer, took up the responsibility of guiding first timers. Various large boulders provided perfect opportunities for breaks and photo sessions. With three cameras and various smartphones in attendance, there sure wasn't any shortage of photographers. Throughout the day, all sorts ofinnovative trickery were tried out. A short while later, we took another break, having found a way to reach a false peak despite doubts of way ahead. We had to take roundabout way to climb up and so came to wide open space with the other peak visible in the distance. To our right, on flatter rock ending in a cliff, was a ruins - just about a feet of rectangular foundation walls. We decided to check it out on our way back. Hills all around us and depending on the angle, we could see the Nandi range of hills in the distance. Few aeroplanes flew overhead too. And just about 90 minutes since start, we had reached first peak. After about half an hour of rest and exploration (and of course photo shoots) we started our way down to try reaching the other peak. We simply thought there was a short-cut on the side and yet again we did find a way. It was trickier too and was slow going till we reached the grasslands between the two peaks. Yet again we ventured ahead without knowing the way ahead. And we somehow found a path to the peak. 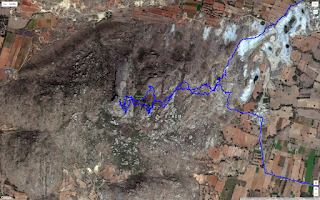 This turned out more interesting than first peak - tricky slope, squeezing in narrow gap, thorny bushes and so on. We had scaled both peaks so quickly that it wasn't even noon yet. After bit of rest, we gathered around to play ping-pong. A good game to get familiar with each other's name. So, everyone has to pick someone else's name. When that name is called, the person has to say ping, the one next has to say pong and next one has to say a name apart from assigned name. Failing to do the appropriate task leads to one strike. On third strike, the person is called upon to dance or sing or say a dialogue and so on. For lunch, we climbed down a short way to sit around a grass clearing. Sun played hide and seek with clouds. Potluck was awesome as usual. And as is BTC policy, we were careful to not litter and took our garbage back for disposal. Before moving on, we took more photos. Our next stop was the ruins. Yet again, we had taken a different route to reach the grasslands between the two peaks. And another tricky slope to negotiate. From there, it was easy hike to the ruins. It was also a great spot to take pic with both peaks in view. After bit of breather, we played another game - courtesy first timers. So, in this game everybody stands in a circle. One would point anyone else in circle along with saying 'He' aloud. The pointed person has to squat saying 'Ha' and those on either side has to swing arms over that person saying 'Who'. And then next person is pointed and so on. The game is fast paced and anyone failing their task is eliminated until last two are declared winners. Before moving on, the photo shoot trickery continued here as well. Jumping and dabs were involved :P Rest of the way down had more of our exploration - a different route than we took coming up. Mainly because of bushes and the fact that the temple was hidden from view until the last bend. The villagers were helpful again, gave us water and told us that we were likely to catch a bus soon from the main road. While waiting, we had our feedback session. 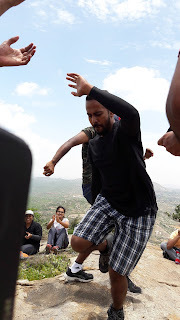 Everybody had praise for the wonderful trek and some suggestions as well.